ICWV focusses primarily on organizing debates and creating books to influence public opinion in Western Europe and elsewhere. It is our goal to make people aware of the antidemocratic tendencies within traditional Islam. We are fighting the new wave of antisemitism in Europe and elsewhere. We try to correct misconceptions regarding the history of Israel and the conflict between Palestinians and Israelis. We expose those who demonize Jews and the Jewish state. ICWV is primarily concerned with developments within Western societies, and focuses primarily on antidemocratic and anti-Israeli tendencies in Europe. Our partners, correspondents, and collaborators are based all over Europe, in the US, and in Israel. The books we initiate and co-create are distributed globally. Therefore these publications play their role in the debate on both sides of the Atlantic. When it comes to organizing conferences, oral presentations, and lectures, our operations are confined to mainland Europe and the UK. ICWV Headquarters is situated in the heart of continental Europe: Amsterdam, The Netherlands. Read the full text of our Mission Statement. Read more about our current activities. 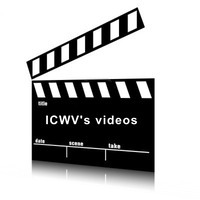 Read about the track record of the ICWV team. ICWV is a non-profit organization ("stichting") under Dutch law. Full name: "International Center for Western Values Stichting"